Here's a report on the Canon ZR1000. Canon probably calls it the ZR1000 because it is about ten times larger than the older ZR100 produced for the Canon L1 and L2 several years ago. In summary, it's is a very useful accessory for folks who use a tripod with the XL1. I am satisfied with it, and while I have not personally used the VariZoom model for the XL1 (and therefore can't compare the two), the ZR1000 provides a lower cost alternative for users on a budget. I am pleased with it. The unit is black, about 1.5" x 2.25" x 4.75", weighs 3.5 ounces and is equipped with a 12" cord. 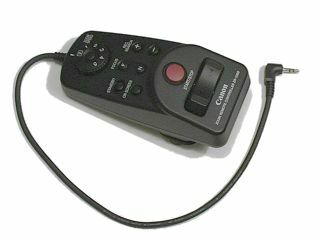 It connects to the camcorder via the LANC connector, is powered by the camcorder, and can be mounted on tripod handles with diameter ranging from 1/4" to 3/4" via a clamp on the back of the controller. There is a rubber gripping surface in the clamp to prevent slipping and rotation. The screws used to hold the clamp have 3/8" x 3/16" knurled heads and coin-sized slots, so it is possible to finger tighten them or use a coin. It also has a finger grove molded in the back to facilitate using it hand held rather than mounted on a tripod handle. I tested it using a Bogen 3063 head. The cord is long enough to reach the XL1 LANC jack with the handle in fore or aft, left or right positions. To use it at greater distance, you will have to obtain an extension cord. Note that LANC uses 2.5 mm sub-mini stereo phone jacks. They are NOT the same as used on most stereo earphones, and are a bit harder to find. Mono cables will NOT work, the connection is stereo only. Do not attempt to use mono cables in this connection. On screen to the left with standby above it. Focus in center with "near" closest to the zoom rocker, Rec Search to the right. The zoom speed dial selects one of 5 fixed zoom speeds, or a variable speed. There is push button in the center of the zoom speed dial that must be pressed to turn the zoom speed from variable to the fixed speed settings. It need not be pressed to select among the fixed speed settings or to return to the variable speed position. Zoom in or out is activated by pressing on the zoom rocker switch. In variable mode, the zoom speed is based on pressure placed on the rocker. In the variable position, the slowest position is 60 seconds and the fastest speed is 2 seconds. I did not measure the in-between positions. Pressing the focus button moves moves the point of focus in the near or far direction. It takes about 25 seconds to move from the extremes. It works in manual mode, or if you are in an AF mode it provides a momentary override on auto focus. When you release the button, AF does its thing. I suspect that this maybe helpful if AF is having difficulty getting an initial lock on a target. The Standby button operates as expected. It puts the camcorder into or out of standby mode. The Rec Search functions as expected. I found that a very brief (momentary) press will move the tape forward by about 6 frames, or back by about 28 frames. The Start/Stop functions as a record pause/unpause and also worked as expected. The case is black plastic with white lettering, but it has metal inserts for the clamp screws. The zoom rocker and start/stop button are the same size as used on the XL1. The Standby button has a slight raised edge around it to make it more difficult to accidentally press it. The buttons are about the same size as the corresponding buttons on the XL1. I've tried it on a Canon L2, but only the Start/Stop, Rec search, and On-screen buttons ar active when used with the L2. I have tried it with the Canon GL1 and it works as expected, although the zoom times are a bit different. The instruction sheet is printed in 5 languages. Street price is under $200.